When discount airline Southwest announced it was coming to T.F. Green Airport in the mid-1990s, the airport experienced a big uptick in enplanements. T.F. Green began attracting many more travelers from Massachusetts and Connecticut. Concurrently, there was a surge in parking demand. At the time, Garage B (the original garage) was the only facility offering covered, garage parking. Soon thereafter, New England Parking (NEP) purchased Garage B and managed all the parking facilities. NEP also decided to buy additional neighboring land and build a new, state-of-the-art parking facility – which we affectionately referred to as the Red Beam Garage. Thereafter, RIAC built Garage A… and the 3 garages (A, B and C) are what we know today. Jim Skeffington Sr. wanted to create a “destination at the airport” for visitors and travelers at T.F. Green Airport. He wanted visitors to say “Meet me at the Red Beam at Green!”, which is why it’s called the Red Beam Garage. He wanted the Red Beam to be lit and high enough to be seen from any point at the airport. The Red Beam Garage was built in 1999 and in 2000, it won “Best Building of the Year Award” from the American New England Chapter of the American Concrete Institute. Our Mission: To be the premier Providence, Rhode Island airport parking facility servicing T.F. Green by virtue of convenience, comfort, innovation and strong commitment to making the parking experience easy. 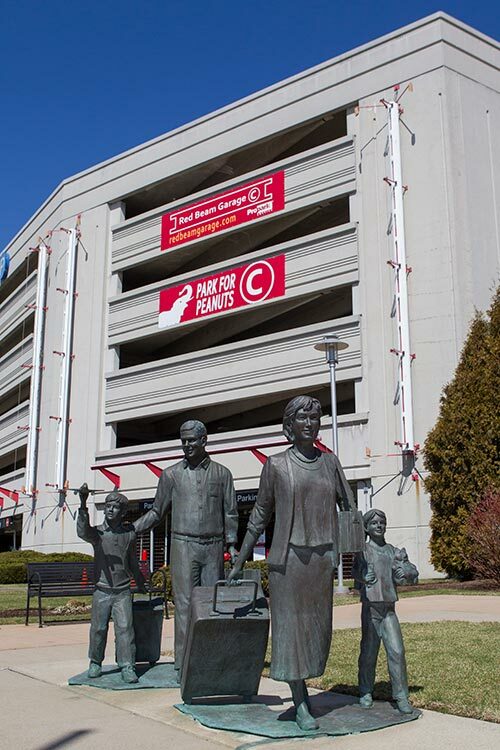 The sculpture of the family that is displayed in front of the Red Beam Garage was created by a local artist by the name of Chris Kane. He currently resides in Pawtucket, Rhode Island. The sculpture features a mother and father figure. These were modeled after Kathy and Karl Sherry of Rumford, Rhode Island. They are the aunt and uncle of Jim Skeffington Jr., the owner of the Red Beam Garage. On the mother’s hand, she is wearing Skeffington’s mother’s college ring from Salve Regina College. In the father’s briefcase, the pocket of the briefcase contains an image of the Providence Journal with an actual front page story about the ascension of the new Auxiliary Bishop of Providence, Robert McManus. Friar McManus was a family friend and priest who became a bishop in the Catholic Church. The little boy and girl were modeled after actual Rhode Island children (unrelated to the family or each other). For more information on the sculptures, see the article below.